To download a clean, unwatermarked image for commercial or personal use, click on the "BUY" button next to each photo and follow the "downloads" tabs to select the appropriate license. All licenses are unlimited term. Images may be licensed for commercial use via the "BUY" button accompanying each image in the galleries. Select the "Downloads" tab to view various size and pricing options. If you are ordering multiple images, or would like a rights-managed contract, I offer discounts. 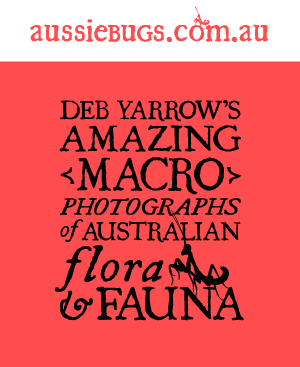 Email me (deb [at] aussiebugs.com.au) with the details of your project. Examples of commercial use include: company web pages, product labels, books, merchandise, magazines, most apps, and educational products. License fees vary depending on the use, but generally fall between $40 and $300 per image. Registered non-profit organisations may be able to license my work at discounted rates, or free of charge, depending on the context of use. Contact me for an estimate; prior permission is required. Educational classroom use by students, teachers, and researchers is free of license fees, strongly encouraged, and does not require prior permission as long as the use does not involve uploading images to the internet. If the project involves posting my photographs to the internet, prior permission is required. All images must be accompanied by a visible photo credit and a link back to www.aussiebugs.com.au (where possible). I do not allow my work to be used in projects involving uploads to sites that apply a blanket Creative Commons license. This means my photographs cannot be used on Wikipedia, Wikispaces, and other similar sites. Participants of academic conferences are welcome to use my photographs in presentations and posters without prior permission. I require images to be accompanied by a credit. Use of my photographs in the scientific literature is considered commercial use and requires a paid licensing agreement. I do not allow my images to be used in press releases without a full rights-transfer. Transfers can be purchased for a limited selection of unpublished photographs, starting at $500/image. Use of my photographs in social media (facebook, blogs, twitter, etc.) by commercial entities is the same as "Commercial Use" (above) and requires a licensing agreement. People acting in a personal capacity are welcome to share my photographs on blogs, web pages, and social media accounts without prior permission, provided that all images are accompanied by a link back to www.aussiebugs.com.au. Failure to attribute an image properly may result in a takedown notice to the web host. Prior permission is required to copy all or parts of my photographs in derivative artworks. Some adaptations I may consider to be Fair Use, others will require a formal licensing agreement. The only way to be sure is to ask.